Hand-built in Austin, TX! Rattletree marimbas are a result of over 20 years of one man following his passion to the far reaches of Zimbabwe. A professional musician himself,Joel Laviolette, first fell in love with traditional Zimbabwean music in 1994. He lived in the country for two years learning the craft from master builders while studying the music. Laviolette maintains relationships with his teachers and friends through regular trips to Zimbabwe. He sources only the finest materials for the marimbas and customizes them to each buyer’s needs. Instruments are built in small batches so as to guarantee the utmost care and individualized attention. Tuning is based on a traditional Zimbabwean families tuning. Based on the matepe played by Joel’s teacher, Chaka Chawasarira. It is close to the key of “G”, has seven notes to the scale, but is not a western tuning. This is the tuning that Joel’s band, his school and student bands use. 19 keys made from the highest quality AAA padauk. Frame is made from red oak. Comes with a pair of practice mallets. Range is from a “D” to a high “A”. This is the marimba that Joel recommends as a great starting marimba as a person can practice most of the parts that are played on the other ranges of instruments on it. This marimba adds three notes to the top of the soprano and removes three notes from the bottom. 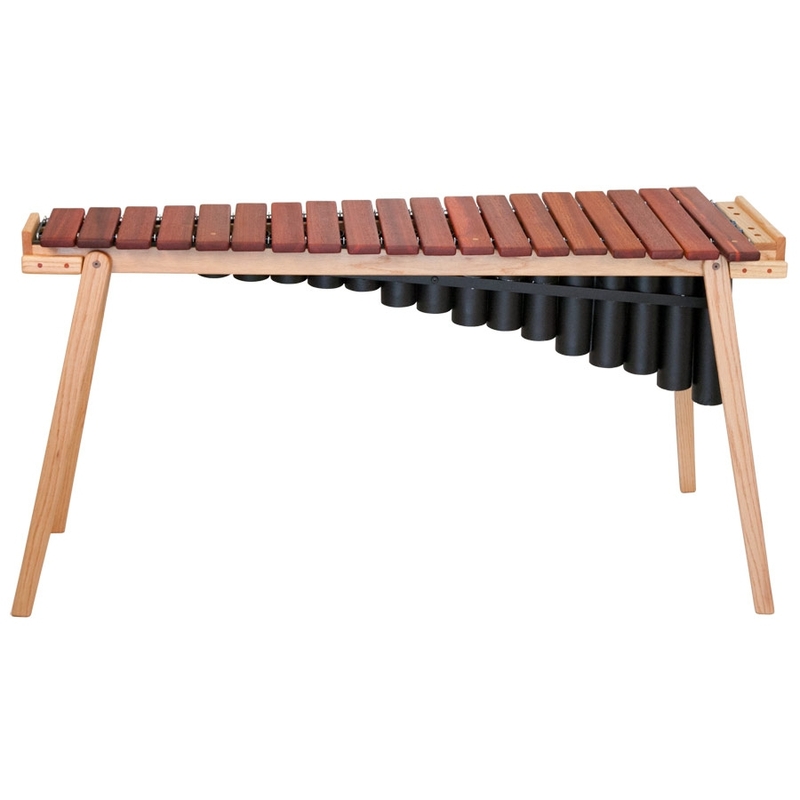 This marimba is recommended for players that will be playing a lot of lead lines. Players can easily play all lead, soprano two and most soprano three parts on this marimba. Other parts may be practiced with octave substitution. This marimba adds one note below the standard soprano and removes one note off the top. This marimba is recommended for players that are interested in the lower sounding marimba parts. All soprano two, soprano three and tenor parts can be played on it. Other parts can be practiced with octave substitution. Includes platform. Keys are typically AAA Cherry. Frames are Red oak. Custom wood options are possible. 8″ diameter keys. Includes platform. Keys are typically Honduras Mahogany or Sipo depending on best quality available at time of order. Frames are White Pine with Mahogany or Sipo trim. Legs and keys are removable. Custom wood options are possible. Similar in size to Baritone marimba. Keys are 6″ diameter and are much thinner for smaller practice rooms. This instrument is great for saving space, but is not recommended for bands that plan to perform in public as the volume is a lot quieter than a performance bass. We build custom chromatic marimbas to order. Standard size is 4.5 octave. 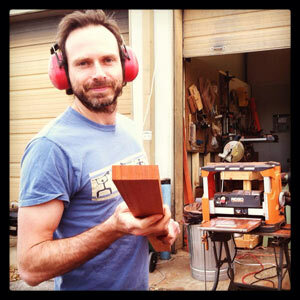 We use only the highest quality quarter sawn AAA Padauk for the keys. Frames are generally Red Oak but mahogany, cherry, and walnut are other common upgrades. Includes PVC resonator tubes that are painted black. Aluminum tubes are available as an upgrade. All marimbas come with resonator tubes included in the price. Resonator tubes are generally PVC that has been painted black. Aluminum resonator tubes are available as a custom upgrade. All marimbas come with one set of practice mallets. Joel also custom makes the common “Zimbabwean Style” marimbas found throughout the US which are usually tuned to “C” and may or may not have an “F#” depending on the needs of the player. Full sets are available at a substantial discount. Call us for details: 512-905-9329. We generally offer a 10% discount on orders of 3 or more marimbas. Standard full set is one lead, two sopranos, two tenors, baritone, bass, hosho. If you live in or near Austin and want to save money on shipping, you are welcome to pick the instrument up at the shop-just call us before ordering.